My latest book, Direct Watercolor <affiliate link, thx) is a retrospective collection of five years of travel and painting, brought up to date with six new step-by-step demonstrations. I’ve been tremendously lucky to have been working as an art instructor with Urban Sketchers (.org) and Craftsy (.com), which, for the past five years has allowed me to focus almost exclusively on watercolor. It’s been an incredible opportunity – helping define what painting means to me. I’ve put all that inspiration together into this self-published book. Truly the very best work from this incredible time of artistic growth. 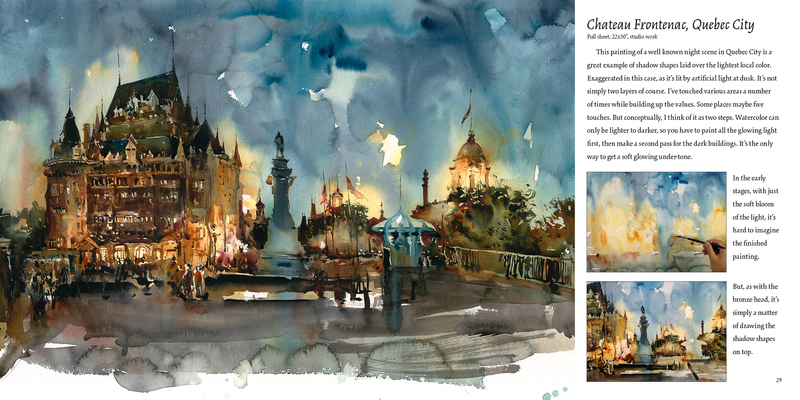 Click here to see more sample pages from Direct Watercolor or order a copy today! My first two art-instructional books represent the two sides of my artistic brain. And I suppose, most of the useful knowledge gained over my 20 odd years as a working artist. For 20 years I have simultaneously been an avid street sketcher and traveling watercolorist, AND a digital artist and video game designer. Though it might not seem like it at first, the two art forms have a lot to do with each other. They’re both about telling stories and describing people and places with drawings. My non-fiction travel sketching is a tremendous asset to my imaginative work – (filling the memory banks with ideas!) – but the theatricality and fantastic elements of gaming art have always brought a special something to my street sketches. Oh, and truly – thanks very much for your support! Every book purchase does a bit toward supporting this blog. It’s my great pleasure to keep bringing you my stories and paintings here on Citizen Sketcher. Super cool! Very excited for you! Wow…looking good….SO looking forward to getting a copy! Marc Taro, I like to book my own copy with your signature and a print if you could beat amazon.ca. So exciting, I’ve followed your blog for a while now, looking forward to the book. Does it hurt your sales if I order it from you? Wunnerful wunnerful so glad for you – and for us. Can’t wait! Nice. Definitely buying a copy. Hey Debra! Thanks :) Yes in fact if you want to order it direct from me, I will sign your copy – and I’ll include a small print with every book I ship out. How’s that for a deal! I’ll put you on the list right now shall I? – and get back to you when it hits stores in October. I don’t know for a fact when I can order copies for my own use. Also don’t know the exact sticker price – but $20-25 is very likely. Will update everyone on this when I hear from the publisher. Yes, please add me to your list. Do you need more info from me at this time? THANKS! Got you on the list Deb – I’ll touch base closer to Oct. when they ship to me, and get your details. Thanks! OK Count me in on that as well. Great News! Also have been following you via website. I would also like to order your book from you (and hopefully) get a signed copy. Very interested in book. Let me know when it will be available .I would like to purchase from you…….. I would love to be added to your list to purchase a signed book! Looking forward to seeing it, just love your work! Sure thing Janet, added your name and I will be in touch as we get closer to October when I know all the details for shipping. Thanks very much for your early support! marc, would of course prefer to odrder from you as opposed to amazon on the idea that you’ll make a few more $$ out of it that way. If so, please put me on the list to order from you. Just looked at Amazon.ca, and at present $18.80 plus $4.00 shipping in Canada so $22.80 in Canada, just an absolute bargain you will always have to refer to compared to a workshop -$200?- which is gone in a couple of days. Great! Please add me to your list, too. Congrats! Please add me to the list for a book. I would also be interested in an online course if you are keeping a list for that as well. Awesome news! Congratulations on the book! I’d like to be added to the autographed book list also. Talk about a nice bonus to the book! Yes, North Light will do an e-version. I’m not exactly sure on the timing of that, but I’ll let everyone know for sure. Thanks! You must have had this in your mind when I left a comment / question a while ago. I look forward to it. Marc, want the signed copy of book, and on your list for online class, can’t wait. Really admire your drawings with such an expressive line. Put me down for an autographed copy as well! Congratulation Marc! I would love to get one directly from you. Always better to put a bit more money in the hands of the artist, I say. Really looking forward to it. I’d also like to get a ebook version when it’s available, so if you have a notification list for that as well, please put me on it. Cheers from rainy Nova Scotia! Finally a book that breaks down all the steps, most books on the subject don’t, they go from A then B, then Z with nothing in between. Can’t wait to read it ! Thanks and Congrats ! Wonderful that you have written this book. However, I will be in Europe next month and would like to see some of the pages on sketching buildings before I go. I will order your book, but it won’t be available until October or sometime later. 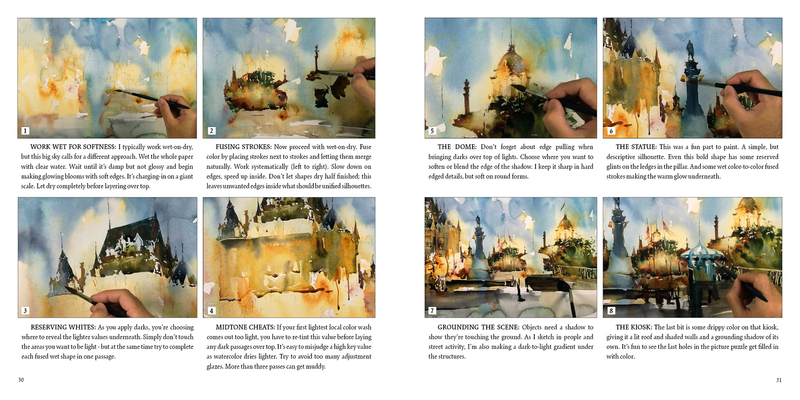 Do you have a sample of some of the step by step approach to doing the watercolor sketches like your St. Parick’s Basilica or Notre Dame de Grace or L’eglise St. Augustine de Canterbury or Meredeth_B? I love your pen and watercolor sketches. I understand perspective, but what to put in and what to leave out as well as color selection is a little more difficult. I hope your autographed copy list is long, but I also hope you still have room for me on it. Sent you an email message, but I would also like to purchase a signed copy. Actually, I would like to order three. One for me and two to give away! Hope you are doing well. Marc, I’m a newcomer to your blog but I’m so grateful for the generosity of your postings. Please add me to your book list. I can’t wait! You bet Leslie – will do! I will get back to you as soon as I hear about the first printing! Waiting for the Apple iBooks version! Can’t wait … any time soon? Which I’m sure will be readable on any color kindle, tablet or laptop. Is the eBook from North Light the same exact thing? It’s only $5! Great price! Hey Sylvia – that is a great price. Almost too great! It is exactly the same, I highly recommend it. I’m fairly sure North Light will not do an iBooks version, sorry. They handle their own ebook distribution – but it’s fully compatible with any book reader. Just click the North Light Shop link at the top, under the cover image, and you’ll see ebook as an option. Book just arrived today, cant wait to start the lessons Marc. Congrats on a great looking book. Existe t-il une version Française de votre livre?